This is a Pangolin. This mammal is one of the most poached animal in the world. He was bobbing his head back and forth, registering the new scents. His scales rose and fell slowly showing off his easy breathing pattern. As he slowly crawled out of his hut the photographer began to capture the images of one of the most trafficked animal in the world (Sutter, 2014). The sound of the click and the flash of the lights became worrisome for Sutter. He thought that this would startle the poor creature, yet it showed to have curiosity towards the camera. He began to sniff the lens and did not show any signs of fear. Phuong stated, with a smile on his face, “he is performing” (Sutter, 2014). This small scaly creature has been called the walking pine cone and the modern-day dinosaur, (Sutter, 2014) but in reality, behind the cage bars, was just a small mammal. 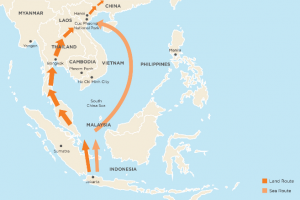 In 2013 CNN reporter John D. Sutter went undercover in Southeast Asia, more specifically Cuc Phuong National Park in Vietnam and investigated the poaching of the most trafficked mammal in the world (Sutter, 2014). This was when he meet Lucky, a pangolin who had been seized from the wildlife trade. To Sutter the creature looked like a modern day dragon. At a pangolin rehabilitation center Sutter was able to meet Lucky, a pangolin who at first seemed to be lifeless. Lucky was four pounds when he was seized and now weighs a total of 17 pounds. He is currently the heaviest and friendliest pangolin in captivity (Sutter, 2014). There are a total of eight different pangolin species, each separated into two different regional groups. The Asian pangolins consist of the Chinese, Malayan, Indian and Palawan pangolins, and the African pangolins, which consists of the tree pangolin, the giant ground pangolin, the Cape pangolin and the long-tailed pangolin. Pangolins are burrowing animals that exclusively consume ants and termites with a tongue that can measure up to 40 cm in length (Zoological Society of London, 2014). They use their tongues to navigate through narrow tunnels and trap small insects for consumption. The pangolin relies heavily on its tongue and sense of smell to find food as it is blind and hunts mostly at night. Although their diets are somewhat varied and can range from insects to earthworms, to crickets and even worms, the pangolin’s stomach is very sensitive; they will usually reject foreign food, for if they ingest it they will become ill (“What is a Pangolin?,” 2014). Pangolins are also covered with overlapping scales that are made out of keratin, much like human hair and nails, and they are constantly growing throughout their lifetime. The pangolin’s scales are filed down as the pangolin burrows into tunnels in search of food (“What is…?,” 2014). They can also run surprisingly fast and use their toes to climb trees and demolish nests when in search for food (“What is…?,” 2014). The Asian pangolin in particular has bristles that grow in between the scales on their bodies, which can serve as a protective barrier from predators (“What is…?,” 2014). Depending on the species of pangolin, the gestation length can range from 65-70 days to about 139 days (“What is…?,” 2014). Cows have been known to have 1 offspring at a time while in the Asian pangolin it has been noted that they can have two or three offspring at a time (“What is…?,” 2014). Although the pangolin infants will nurse for about two to three months, at one month of age they will begin to eat insects and follow their mother outside of the burrow, riding on the base of their tail (“What is…?,” 2014). When startled, pangolins curl up in order to protect their undersides from predators (“What is…?,” 2014). They will also hiss and lash their tail and paws out as an attempt at wounding the predator (“What is…?,” 2014). Pangolins are also very intelligent creatures. According to an old trafficker, pangolins had once attempted to escape from his home by “curling up into balls and then spinning with Sonic-the-Hedgehog speed to burrow through the floor…they [hid] underwater for upwards of 15 minutes without air” (Sutter, 2014). This animal is clearly capable of fending for itself. The pangolin has a wide distribution that comprises of “southern China, Hainan, Taiwan, Hong Kong, the Himalayan foothills in eastern Nepal, Bhutan and northern India, northeastern Bangladesh, across Myanmar to northern Lao PDR and northern and central Vietnam, northern and northeastern Thailand” (Zoological Society of London, 2014). This distribution makes it possible for rapid capture of the Asian pangolin by poachers. The many different qualities of pangolins make it the most commonly poached mammal in Asia. The pangolin is primarily hunted for food, traditional medicines, fashion accessories and for the trade of their scales, skins and meat (“What is a Pangolin?,” 2014). These hunting incentives are rapidly dwindling the Asian pangolin populations. Mainly because of the high demand from China, Asian pangolins have been poached to the point where now four species have the status of endangered or near threatened. In August of 2013, about seven tons of pangolins were seized from Indonesia at Haiphong airport and in 2008, nearly 14 tons of frozen pangolins were seized in Sumatra, which was a stop on its way to either Vietnam or China (Sutter, 2014). If the rapid decline in the Asian pangolin populations continues, the high demand for pangolin will not be able to be met, creating an uproar among those who hunt and buy the pangolins. The Chinese culture will not be able to support the demand for pangolin-based foods, remedies or products because of this population decline. The absence of the pangolin in the food chain will also create a trophic cascade, causing the insect population to increase rapidly. The consistent poaching of the Asian pangolin is placing the population at risk of extinction. By establishing pangolin farms in Southeast Asia, the pangolin population will increase, the ecosystem equilibrium will be restored, and the high demand for pangolins will be met. Having an uncontrollable insect population could potentially affect other organisms, including humans. For humans, this would mean that there would be no natural pest controller for their crops and there would be no means of supply for the high demand. Thus, their crops would become overrun by insects and the economy of the countries would take a toll along with its culture. An increase of insects and a lack of supply would certainly be two outcomes from the disappearance of pangolins, but a third consequence would be the decrease in some of its main predators. The most common predators of the pangolin are the large cat species. This includes lions, leopards, tigers and hyenas. According to research conducted by T. Knight et al. from the University of Florida, their results showed that interaction between species can cause a ripple effect across ecosystems (Nature, 2005). These predators rely on the pangolin as a source of nourishment and so with a lack of nutrients the populations of its predators could decrease. The implementation of pangolin farms would help deter the human population from poaching the population that these predators need to survive. The absolute extinction of wild pangolins will allow insects to overpopulate and start its predators. Pangolins are intrinsically linked to both its predators and prey; they are an essential part of a balanced ecosystem and therefore their survival is of the utmost importance. The continuous poaching these animals means a lower supply for the high demand of pangolins in the different Asian countries. Many of these countries poach the pangolin as a source of food and then their scales are harvested for medicinal purposes. In countries like Vietnam, pangolins are offered to those who seek to establish some type of class hierarchy. Pangolin fetus is considered a delicacy and it helps establish a person’s wealth status by showing that they are capable purchasing and consuming a rare and endangered species (“Meet the pangolin!,” 2011). According to Christopher Shepherd, who is the Deputy Regional Director in Southeast Asia of TRAFFIC, an organization that fights against the illegal wildlife trade, stated that, “Eating illegal meat is a sign of being above the law and of being able to afford such a meal” (Hance, 2013). In 2000, it was estimated that there were over 50,000 pangolins living in China. Currently this number has dropped to less than 5000. Being able to establish some types of status signifies the importance of the pangolin to the Asian culture, but if these mammals go extinct then the ability to confer this status will no longer be possible. With pangolins being considered a delicacy in Asian countries, it would not be wrong to state that the prices of pangolin products have gone up. The now estimated cost to consume a pangolin is about one thousand dollars (Guilford, 2014). Although the pangolins are rising in price there has still been a continuation of the capturing and illegal trafficking of these animals. The amount of pangolins that have been captured has grown within the decade. According to the International Union for Conservation of Nature (IUCN) “at least 218,100 pangolins had been seized between 2000 and 2012” (“World experts: all pangolin,” 2013). This is just a small fraction of pangolins that have been poached and would later on be seized by the government. In many restaurants in South East Asia and in China it has been known to serve a variety of endangered wildlife (Sutter, 2014). An entire pangolin is known to be at a price range of $250 to $350 per kilo, while the scales (whether it is for consumption of medicinal needs) will go from $600 to $1,000 per kilo and the price of pangolin tongue and fetus is still unknown (Sutter, 2014). About 90% of these pangolins have been captured throughout “China, Hong Kong and four South-East Asian countries- Indonesia, Malaysia, Vietnam and Thailand” (“World experts: all pangolin,” 2013). 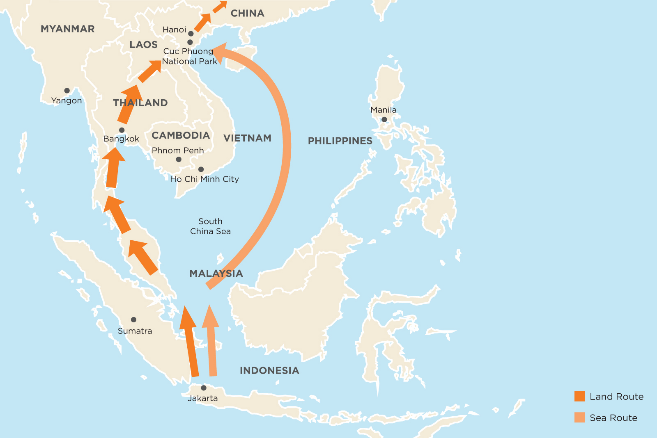 Pangolins are usually seen to be trafficked from many of the Southeastern Asian countries and according to Sutter, it was seen that pangolins were generally trafficked by plane and by boat (2014). Being able to establish a farming system will be able to provide for this type of commerce. These animals will be able to continue with their role in the Asian culture at an affordable and reasonable price. The farming system would lower the price of the pangolin dishes and be able to support the large culinary demand. Although these animals are hunted for their meat, their scales come at a high price as well. The scales of the pangolin is a major incentive for their poaching. While the meat is considered to be a delicacy it is also believed to have medicinal purposes. Collecting these scales help sell the pangolins faster to farmers and to those who do not believe in modern day remedies. In traditional Chinese medicine the pangolins blood and body parts have been used to treat cancer, asthma and reproductive problems (Block, 2013). The Chinese government has even permitted certain hospitals to use pangolin medicines as treatments for their patients (Block, 2013). The high demand for their scales for medicinal use has also definitely contributed to their population decline. A fully grown pangolin can hold up to 1,000 scales on its body. The scales, being made out of keratin, are something that are rarely found in the world. According to Rhishja Cota-Larson from Project Pangolin, the pangolin’s most distinguishable feature, its scales, are causing its inevitable population downfall (Hance, 2013). Although it is generally believed by consumers that the scales have some type of medicinal properties it is not confirmed. The lack of scientific evidence regarding the medicinal properties of pangolin scales should be enough to deter its poaching. Although there have been regulations implemented controlling the trafficking of pangolins they have proven to be unsuccessful. The continuous decrease in the pangolin population has brought them down to a status of near extinction. Under the international law, all eight of the pangolin species are protected and currently, the four African pangolin species can only be traded internationally with the approval and accompany of CITES, or, the Convention on International Trade in Endangered Species of Wild Fauna and Flora (Cota-Larson, 2014). Although there are strict regulations to the poaching and trading there is still a large number of hunters being caught trying to illegally trade these mammals. In November of 2013, the Vietnamese government decreed that the pangolin was of the highest category of legal protection, this meant that the use, sale or possession of any live or dead pangolin would lead to a maximum penalty of seven years in prison or a $25,000 fine (Sutter, 2014). According to Sutter, enforcement is not rigorous enough and this can be seen when waitresses, at different restaurants, stated that “ordering pangolin is legal” (2014). Cota-Larson noted that in the year of 2013 was the year that had the highest number of pangolin poaching. She states that about 8,125 pangolins were confiscated leading to about 49 instances of capture by the government across 13 countries. “Because seizures represents just 10 to 20 percent of the actual illegal trade volume, this strongly suggests that approximately 40,625 to 81,250 pangolins were killed in just one year” (2014). According to Dan Challender from the University of Kent compared to pangolins “elephants would come close to the most-trafficked title in terms of total numbers” (Sutter, 2014). Even with these regulations it is likely that many are not being enforced. According to Dr. Shepherd many laws and regulations are not adequately enforced and that this has become “an issues of high priority” (Cota-Larson, 2014). There also seems to be a lack of “adequate investment and political will”. Due to the lack of enforcement it has become easier and easier to poach pangolins and with the increasing demand of pangolins, whether for their food of medicinal use, the population is dwindling down to an extent that in the very near future Asian pangolins will become extinct. Thus, implementing newer and stricter regulations on the supplying of pangolins is not enough to fix this detrimental problem. In order to solve for the crisis that faces the Asian pangolins today it is critical to develop a pangolin farming system. It would be unrealistic to try and completely abolish the poaching of pangolins from China, a country that has instilled this creature into its culture for the extensive use in medicines, foods and class establishment. It would be impossible to completely eradicate their use. The implementation of this system will not only be able to support the high demand for pangolins but it will also be able to supply it. This pangolin farming system will be modeled after the modern day farming systems of livestock. Compared to cattle, who have a gestation length of about nine months, pangolins have small gestation lengths (Parish, 2010, pg. 4). With a maximum of 139 days, it would be possible to farm these creatures. They are also capable of producing a maximum of three offspring at a time and are more easily and quickly weaned. They begin to ingest insects at one month of age and follow their mother outside of their burrow. Breeding these animals to meet the high demand of pangolin based products would be able to direct the attention of wild pangolins to a commercially based system. This system would allow for the wild population to grow in time while being able to support the culture based needs, evading the problem of changing a culture that has been based on this ideal for years. In the past, farming of specific species have been seen to be successful. Successful farming of wildlife has been seen in tigers, crocodiles and vicuñas. According to R. Craig Kirkpatrick and Lucy Emerton from the Environment Management Group “farming would increase the supply of [pangolins], prices will fall, and poaching will no longer be profitable” (pg 655). Being able to supply these purposely breed pangolins, due to the implementation of a pangolin farming system, would help support the increase the pangolin population whilst continuously supplying the high demand from China. Two huge groups of people would have an issue with pangolin farming; this would be the people who believe captivity is not the right place for pangolin and people who are reliant on pangolin poaching, which can range from farmers to professional hunter. When dealing with wildlife animals there is always an issue of having to protect and accommodate for that animal as if it were still in the wild. This task can be a difficult one at times. 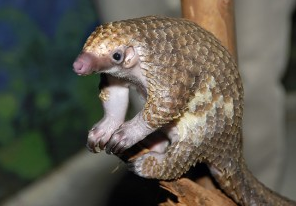 According to Sutter, pangolins do not do well in captivity. Usually the problem is food or a stress related predicament. Phuong states that about 40% of pangolins who arrive at the Cuc Phuong National Park die within a day or two from arriving due to the amount of stress that they have been going through (Sutter, 2014). The pangolins who are able to arrive to the center safely are immediately injected with hydrating fluids and are kept in quarantine until it is possible for them to be moved to a larger pen (Sutter, 2014). According to Sutter, pangolins are very sensitive creatures and they are easily stressed and “The stress of captivity alone can be fatal” (2014). Sutter also states that many of these pangolins can go days without food or water during these trafficking routes which perilously dehydrates the animals (2014). Due to the lack of pangolins in captivity there is not enough research available on the cause of their deaths. When concerned about their dietary problems the best known food blend for these animals is a combination of frozen ants, silkworm larvae and soy. Many of these animals still have dietary issues despite this food source. Many pangolins hate traveling and get very ill if they are not fed and gave water regularly (Sutter, 2014). Many pangolins get saved from being poached, but then die from the stress from transportation and captivity (Sutter, 2014). According to Phuong, “Forty percent [of pangolins] die within a day or two of arriving at the [pangolin] center” (Sutter, 2014). Although the mortality rate is high it is unclear if captivity is the real problem here. There is a difference between being captured and then taken to an unfamiliar, small habitat to live out your life, and being raised your whole life in said habitat. Dogs, cats and cattle were all once undomesticated, but now they are a part of households and farms. To successfully breed and farm the pangolin, something similar to this must be done. If pangolins that are able to handle the stress of captivity are bred, chances are their offspring will be able to handle the stress as well. Since these young pangolins would only be accustomed to the habitat home, they would be significantly less stressed than the ones that were captured. These animals would be raised for food and not to be released into the wild, so they would never experience extreme stress. Between being bred to be calmer and being in the same environment, there is a higher chance of these animals being successful in captivity. In the 20th century a study was performed testing the concept of fox-farming. Wild foxes were bred to be tamer than they currently were. Although the experiment fell apart when the lead scientist passed away and the Soviet Union collapsed, it lead to the concept that animals can be tamed on a genetic level (Ratliff, 2001). If the foxes can be breed to handle stress well, and be raised, by human hand, then it is quite probable that the pangolin can be successfully bred to be raised in captivity as well. Thousands of years ago, cattle started to become a domesticated animal. If people back then could domesticate an animal why would it be so difficult to domesticate an animal today? According to Wilkins, cattle were once almost impossible to domesticate. Today, they are one of the most farmed animals (2012). With today’s technology working to our advantage we can achieve faster results. We know what to look for when breeding, calmer and tamer pangolins. Pangolin breed quicker than cows do and deliver more young at once. Cows gestate for about nine months versus the 65-139 days it takes a pangolin (“What is a Pangolin?,” 2014). Cows only deliver one calf at a time and pangolins typically deliver 3. Research can be conducted to see if there is an environment the pangolin would prefer in captivity. If people without the resources we have today can do it, we can do it as well. Starting in the 1960’s crocodile farming began to help with the demand of these animals. The main products people want from crocodile is the skin; meat, teeth and live animals are important byproducts. In 1993 World trade numbered 80,000 skins annually. By 1996, the industry just in Zimbabwe was worth $5 million US from sales of hides and meat. Production can help increase the commercial production of the crocodile, while reducing the threat of over-exploitation (Dzoma, Segwagwe & Sejoe, 2007, pgs. 277-278). This helps decrease the amount of crocodiles being hunted and prevents their numbers from being decimated. If we can implement the same principles on pangolin farming, it is possible for the pangolin population to strive and not fall into the category of extinction. Although to the farmers there is a large profit in hunting pangolins, if there are none available in the wild then they will not be able to hunt them and gain that source of secondary income that they wish to attain. According to Dr. Chris Shepherd, pangolins are consistently collected by people who live in rural populations, for example, the island of Sumatra has plantations, forests and agriculture, making it the perfect habitat for the pangolin. The people there know that if a pangolin is found it can then be sold as another form of income, almost like finding a $20 bill on the ground (Cota-Larson, 2014). With the low income that these people see throughout the year being able to poach a pangolin and sell if for a larger profit is a necessary thing. According to Sutter “Some pangolin hunters say they’re just trying to support their families. They use the money to buy milk, not luxury items” (Sutter, 2014). Many hunters have also stated that Asian pangolin populations have declined so much that it has actually become much more appealing to travel to Africa to hunt for the African pangolin, which is now decimating the population of pangolins in Africa (Cota-Larson, 2014). It was estimated that 41,000 to 60,0000 pangolins have been poached for the black market since 2011; this has increased the prices of pangolin from $10 US per kilogram from the 1990s to almost $200 US per kilogram in 2011 (“Meet the Pangolin!,”2011). Although these hunters can obtain a good profit from finding pangolins, it would become unnecessary to hunt for pangolins if the demand was not so high. According to Ruslan, a 58 year old pangolin hunter “If we were rich people, we wouldn’t want to go into the forest to hunt pangolin”(Sutter, 2014). If the pangolin farming program came about, it could be possible that these hunters could switch and become pangolin farmers. This way they are capable of maintaining this source of income by selling pangolins. Farming would help give the hunter a profit that would benefit them for years and it would help keep the pangolin from being poached to extinction. This would provide a steady form of income and it would reduce the price of pangolin products. Being able to buy pangolin meat at a reasonable price would be something that the pangolin farming would be able to supply and thus the hunters would not have to trudge through knee-high waters during the night in order to gain profit. The pangolin is a beloved part of the Asian culture and a critical part of the ecosystem. Unfortunately, these poor animals are being poached in large numbers, decimating their population. Without some form of system to maintain their numbers, they will be wiped from the planet permanently. Due to the heavy ties in Asian culture, a ban on the poaching, selling, or consumption of pangolin would never succeed. A proper farming program will be what saves them. Pangolins play a large role in the ecosystem and their absence can cause catastrophic problems. It would be impossible to completely eradicate their use in the Asian culture because of their large role but, without them the insect population would increase dramatically, while the predator population would decrease significantly. Additionally, if pangolins were to go extinct, it would not be possible for the people to supply consumers with their pangolin medication or dishes. The pangolin farming system would increase both the wild population while having a separate population acting as a supply system for those who demand the pangolin for its products. We know that farming these animals would be the best solution to fix such a problem. Hopefully some sort of changes occur before we never see these essential animals again. Ayodele I. A., & Soewu D.A. (2009). Utilisation of pangolin (Manis sps) in traditional Yorubic medicine in Ijebu province, Ogun State, Nigeria. 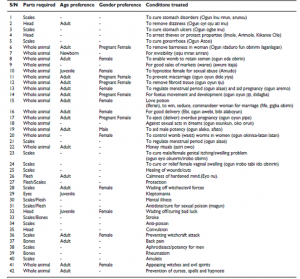 Journal of Ethnobiology and Ethnomedicine, 5 (39). doi: 10.1186/1746-4269-5-39. Grosshuesch, C. (2012) Rollin’ with the pangolin (manis temminckii). 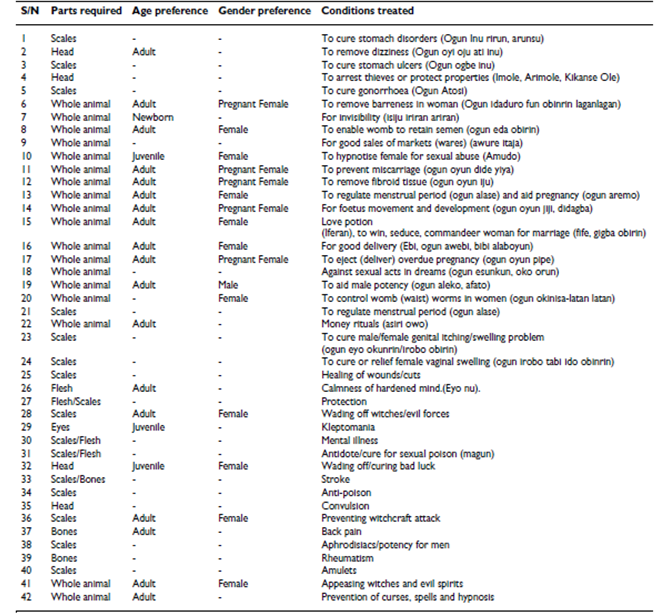 Retrieved from http://bioweb.uwlax.edu/bio203/s2012/grosshue_crai/index.htm. There are so many inaccuracies in this article, it can hardly be taken seriously – notably: pangolins are NOT blind – they have poor eyesight / their diets are not varied – they feed exclusively on ants and termites – they do not eat other insects like crickets, worms etc / pangolins have ONE pup – very occasionally, they have 2 pups – a pangolin with more than 2 pups has never been seen / pangolins use their long sticky tongue for foraging of ants – they don’t use tongue muscles for closing their mouths so that ants don’t escape / adult pangolins have no predictors except for man – lions may try and eat them, but are unable to.penetrate through the hard scaly exterior. How can a person who publishes so many inaccuracies be relied on to discuss pangolin farming. Pangolins are almost impossible to keep in captivity and their scales are made of keratin- like finger nails, it would be absurd to suggest they can provide a cure. The answer is no – no to endangered animals in Chinese medicine. The Chinese will have to get over it. Corrections to comment above: mouth muscles (not tongue muscles) / predators (not predictors). is really good, appreciate it for your efforts. Are there pangolin farms in the USA for conservation? How can participate? Did you know tiger and rhino farms in Africa and China did not help decreasing the illegal poaching of these animals? By farming pangolins, the demand for their meat, blood and scales will only increase. It would be better to get the myths about their health benefits out of this world. Besides, did you see in what kind of enclosures farmed pangolins live, or did you miss the PangoLeaks? There’s nothing sustainable or natural about China’s way of pangolin farming. In a year we will find ourselves cutting down the last rainforests of Southeast-Asia, to keep herds of pangolins in empty, muddy enclosures. Just like cows in Australia or the Amazon. Wouldn’t that be ironic? Please take a look here: https://blogs.umass.edu/natsci397a-eross/using-pangolin-farms-to-stabilize-the-pangolin-population/. And think again: will farming be the solution to stop pangolins from going extinct?